Convenient Parking is available near the Hard Rock Hotel Chicago at the listed Parking.com locations. Click on the location address for location hours, rates, detailed location information, and a map. 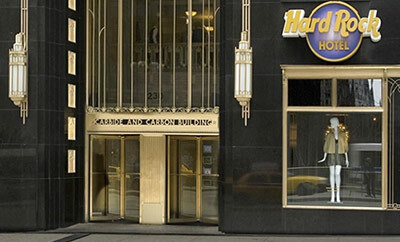 Located in the historic Carbide & Carbon building, the Hard Rock Hotel Chicago provides a modern vibe with the signature Hard Rock style in the heart of Downtown Chicago. Enjoy dining at Chuck's Restaurant or Mr Brown's Lounge inside the Hotel or visit one of the many nearyby restaurants while shopping the Loop.